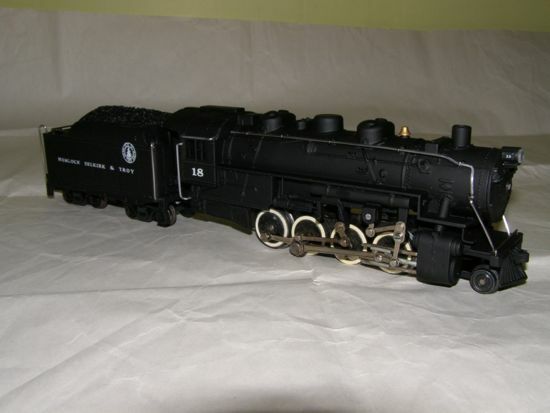 I have heard people talking of making a 2-8-0 from the Gilbert 0-8-0 for some years. This always sounded like an intriguing idea. 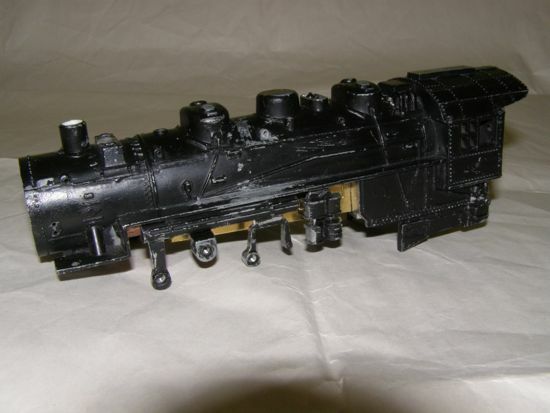 Also, I remember seeing an article in a model railroading magazine about a fellow who modified the 0-8-0 boiler into a nearly full round boiler. 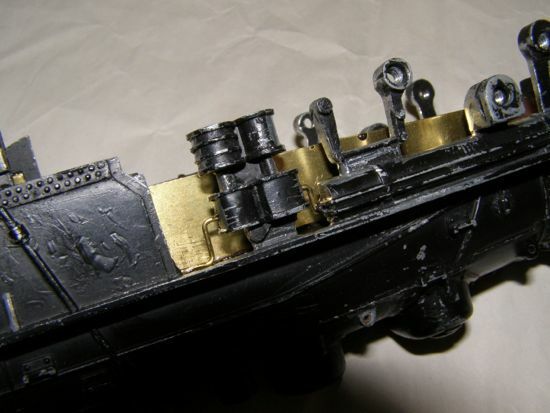 He removed everything below the running boards, made some boiler segments and attached them below the running boards, and then rehung all the valve gear and other boiler fixtures. It turned out to be a rather impressive model. One of the things I had disliked about the Gilbert 0-8-0 is the way the designers put everything below the running boards on a flat plain. 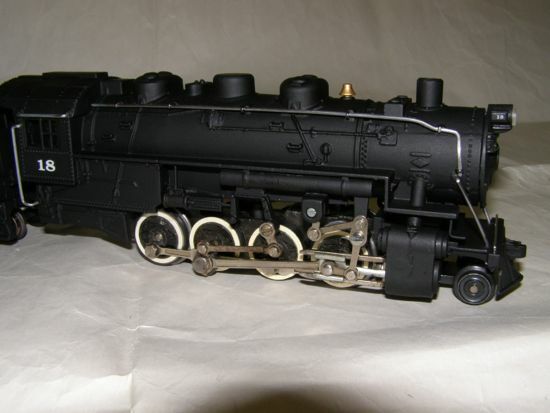 The air pump, valve gear, reversing pump, and everything else was raised above a flat surface. This surface was not even in line with the contour of the boiler above the running board. 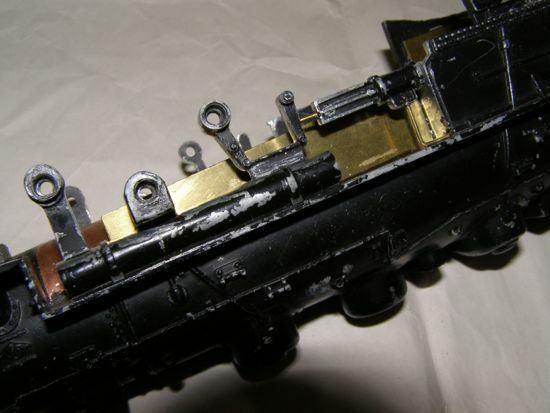 This was done because the boiler, although in true 3/16ths of an inch to a foot scale was made to house Gilbert's O gauge motors and frames. 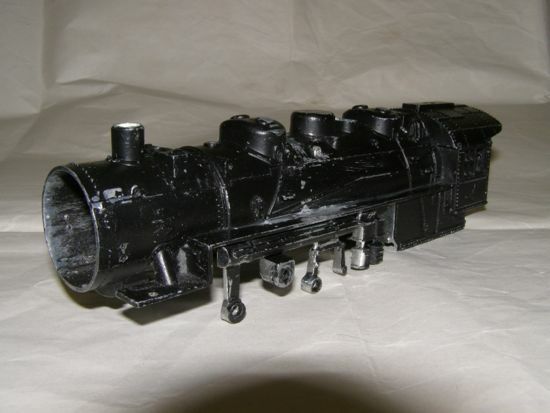 After World War II when Gilbert came out with S gauge track the smaller mechanisms were installed but the basic boiler casting was not changed. 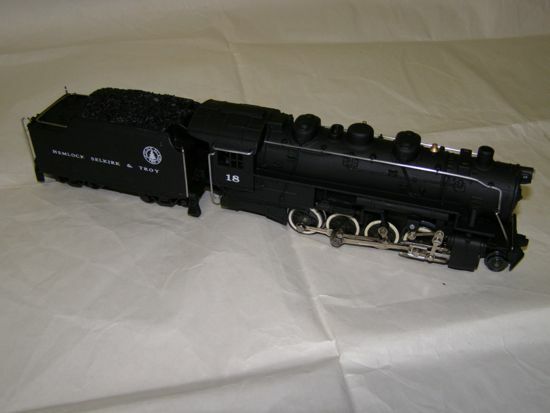 This was a bit of a drawback to me to want to do anything with this locomotive. 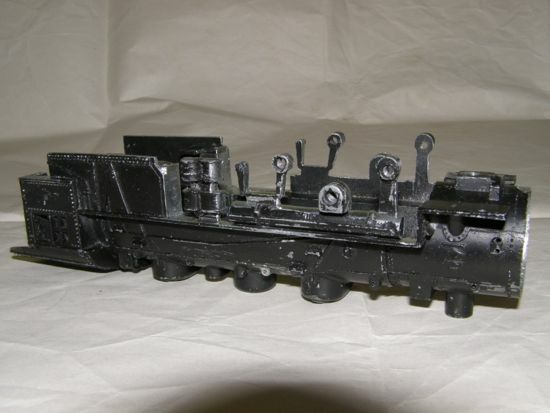 So, when I acquired an old 0-8-0 boiler casting I got to thinking how I could modify it to create a 2-8-0 without the flat sides. 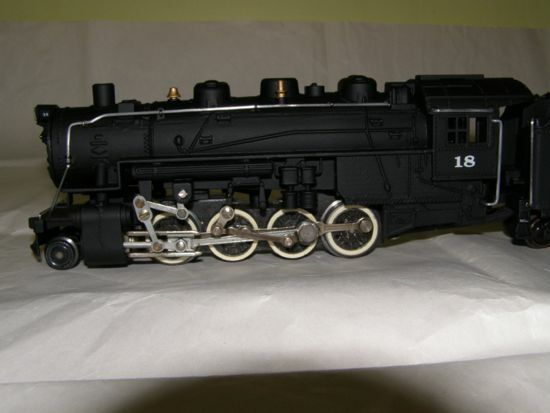 I decided to do something similar to the fellow who made the near full round boiler: a 2-8-0 with three-dimensional features under the running boards. 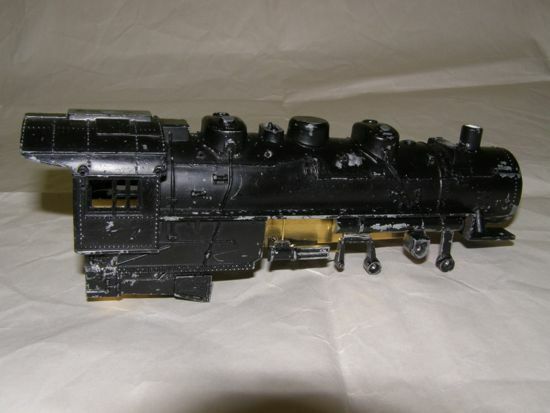 First I figured out if I could modify the 0-8-0 steam chest and an Atlantic pilot to fit on the front of the locomotive and leave room for a two-wheel pilot truck. 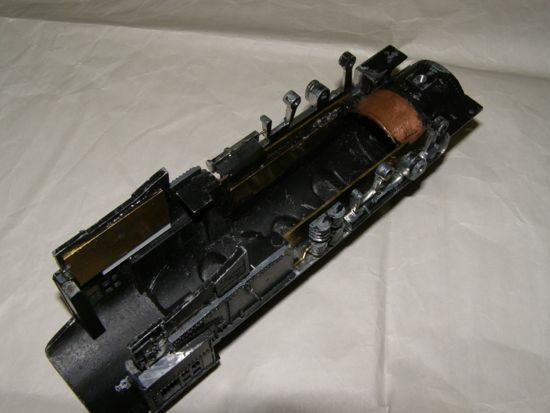 The picture shows the modifications I made to the steam chest, pilot and an Atlantic boiler front to fit the boiler and have an operating pilot truck. It took a little imagination but I was able to make everything fit. After ensuring that the locomotive was operationally sound I set about figuring out what I needed to do to modify the boiler sides. I finally decided to use a hack saw and cut around everything I wanted to keep in place. So I made cuts around the valve gear hangers, air pump, firebox, and removed the whole reversing pump for re-installation later. Next I used a file and CAREFULLY removed all the material immediately around the items left on the boiler casting. The pictures show how the boiler looked after this step was complete. I also removed the "stuff" below and behind the firebox. 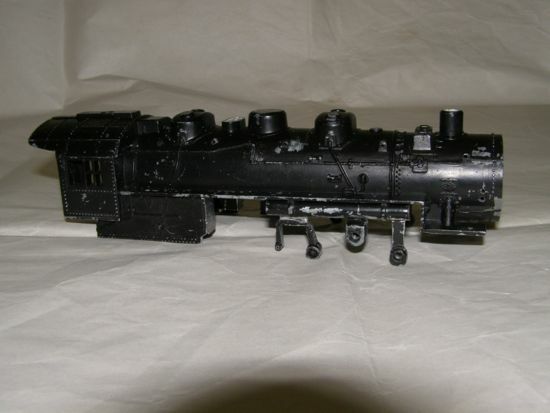 This would be reinstalled later in roughly the same place but would be slightly inside the plane of the firebox sides. Next I created a piece to make the boiler behind the cylinders fully round. This was as wide as I could get it and still allow the smoke unit to be inserted into the boiler. In addition to this I made two flat sheets in the profile of the boiler. 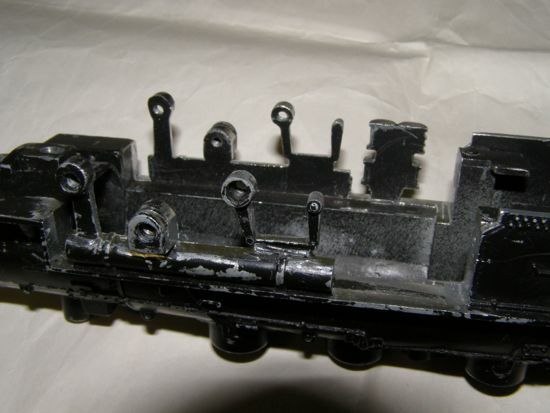 These were attached below the running boards in line with the boiler, about 3/16th of an inch in from the valve gear hangers and other items still attached to the boiler casting. 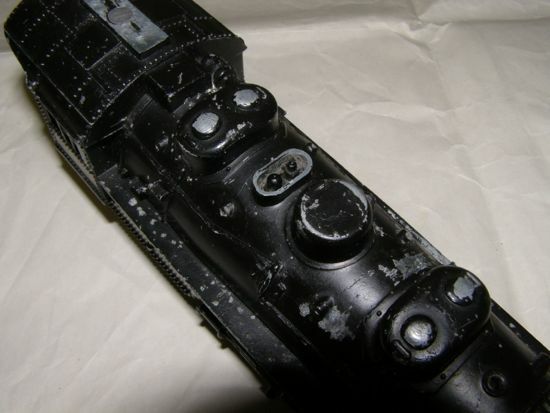 The pictures show how the boiler looked after this step. 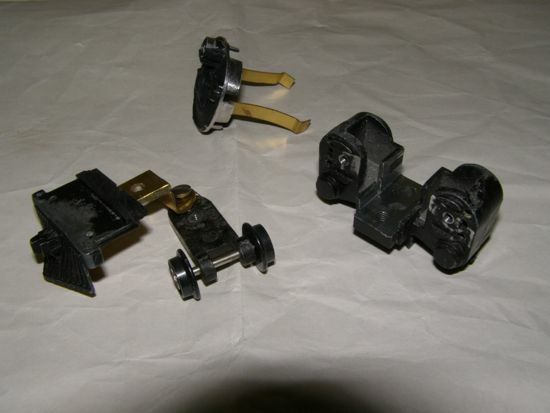 These pictures also show the reversing pump reattached. 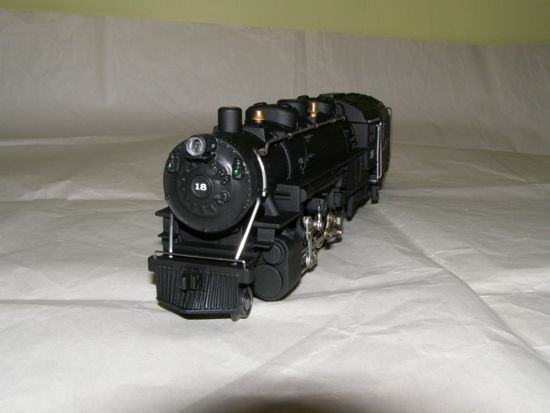 I also attached some piping from the locomotive to the air pump and reversing pump. The top of the boiler had a simplified representation of a housing for the pressure relief valves. This housing had a flat top. I drilled out this housing and installed some valves inside the housing. 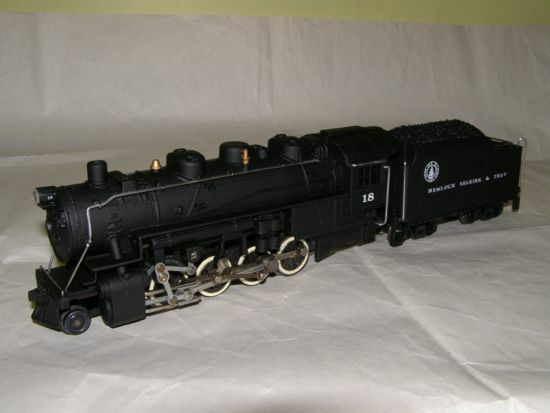 The tender is not mentioned much because it is made from the remnants of the two Hudson tenders I cut up to make the long, 43-ton capacity tender for my NYC Mohawk. 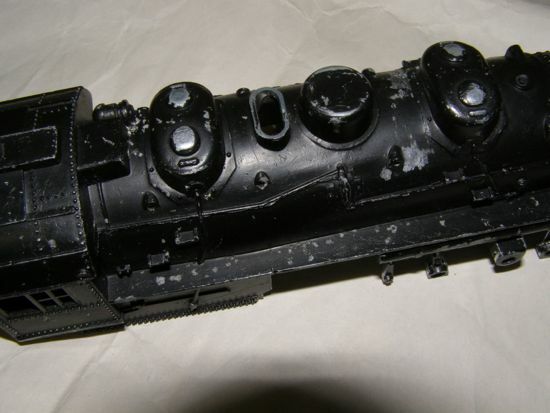 I hate to waste pieces from these old castings. It made up into a nice short tender that looks really good behind this relatively small locomotive. 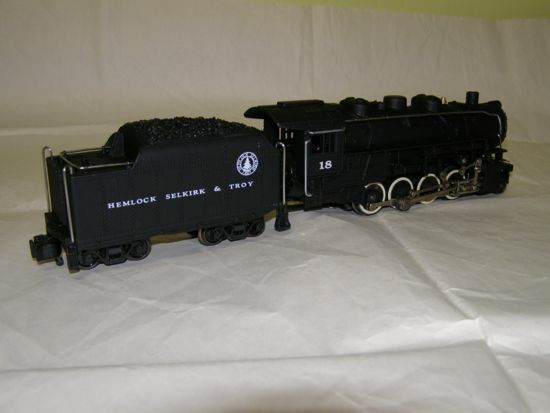 It is painted and lettered for my Hemlock, Selkirk and Troy (HS&T) railroad. 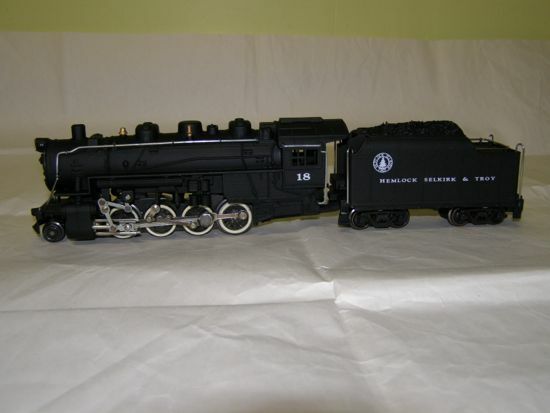 Since it doesn't follow any specific prototype railroad's design I decided to make it one of my own.